Posted on January 25, 2016 . by Patrick Johnstone. Leave a comment. We had a very light agenda this council meeting, and between a sparsely-attended Public Hearing and no Public Delegations, it was a pretty unspectacular night. Of course we had a full Council Day with a closed session and an Open Workshop earlier in the day on the City’s Financial Plan, so the little time we spent on TV doesn’t mean we didn’t get work done. There are some storage lockers in the Plaza88 development that are not being used by the commercial or residential users of the facility. The owners of Plaza88 want to open them up for commercial rental, but that is not allowed under the current zoning. Therefore a change in the zoning Bylaw to allow that use at this location was required. Such a zoning bylaw change requires a Publci Hearing. The City received no correspondence on this matter, and no-one appeared to speak at the Public Hearing. The public engagement of the Strata members of the Plaza88 Development indicated no objection to this change of use, and the Engineering Department had not problems. So we moved to send it to third Reading. We than went on with our Regular Agenda. As just discussed, we moved Third Reading of the Bylaw that would allow commercial storage lockers at Plaza88. As discussed last meeting, we moved Third Reading of this Bylaw to change the terms of reference for the heritage commission. This follows up on my request from two weeks ago to follow up on a request from the Provincial Eating Disorder Awareness Week campaign to light up Anvil Centre Purple on February 5th to support the initiative. Council voted to support his one-time request, and we will be getting a report back from staff on a longer-term policy to support future requests like this. And that, my friends, was it! See you next week! Posted on January 22, 2016 March 7, 2017 . by Patrick Johnstone. 4 Comments. Uber is not coming to New Westminster any time soon, and I’m OK with that. Many of my friends, especially the younger, more tech-savvy and “connected”(ugh) cohort, will not like hearing that, but there are many good reasons to question the Uber model, and how that type of service fits into the existing regulatory environment around ride-sharing services. It may actually challenge many of our assumptions about how business operates in the decade ahead. So we need to proceed with caution, as New Westminster Council discussed at last week’s meeting. Full disclosure: the closest thing to Uber I have ever used was in San Francisco a couple of years ago. We were visiting a friend, staying in Pot Hill, and needed an early taxi ride to the airport. Our host suggested taxis were notoriously unreliable at that time in that neighbourhood, and suggested we call for a Homobile. This was a “ride sharing” service set up to address a specific problem: the Trans community were regularly being passed by the regular taxi services, especially at night, and that even in the (arguably) most queer-friendly City in America, Public Transit and traditional taxis are often not the safest environment late at night for a demographic that still faces disproportionate threats of abuse and violence. Homobile was started as a volunteer service to make sure that everyone could safely get home, and evolved into a collective not-for-profit that returns its revenue right back into a social enterprise that helps the community. We were, of course, white bread tourists looking for an Airport run, but were told up front it was by donation, whatever we could afford. We paid what would have been the “going rate” for an airport run in a traditional cab (with a tip) and got a ride from the actual Lynn Breedlove (who regaled us with memories of the queer punk scene in Vancouver in the 90’s). It was unregulated, non-traditional, and cash-only, but to us it was revolutionary, and operating as a social enterprise that we could support. Uber is, unfortunately, few of those things. First off, Uber is an unregulated provider of a commercial service in a highly regulated market, and that lack of regulation provides them a large economic advantage. There is little revolutionary about that. Sure, they use a smart phone app and on-line rating system to manage their sales and billing, but that is more a distraction than the centre of their business model. If we had an unregulated parcel-delivery service without a business license, whose drivers drove un-inspected and under-insured trucks throughout neighbourhoods with drivers not licenced for those trucks, I suspect our community would be concerned. Would we want an unregulated airline offering door-to-door helicopter rides with uncertain pilot training or vehicle licencing? Of course, this is a ridiculous example, but the fundamental argument is the same. I started writing this post last weekend, and as is typical in the “tech world” (ugh), the story changes fast, as the provincial government has started hinting towards a shift in thinking in Uber, and to put that in context, you need to know the regulatory landscape as it is. The Taxi industry is regulated at the provincial level. Some powers under that regulation are delegated to local authorities, but the regulation is 100% provincial. 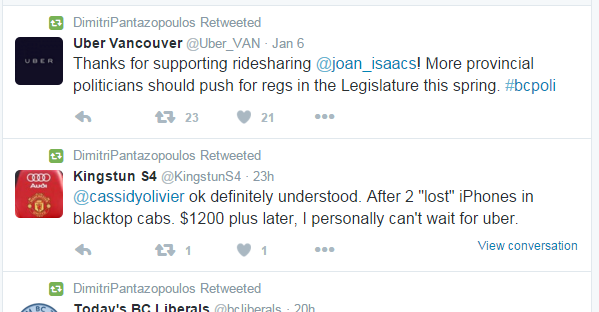 If Uber wants to operate in BC, they will need to comply with the B.C. Passenger Transportation Act, and currently, there is no sign they have ever sought a licence to do so. In saying I am not positive about Uber, I’m not saying the Taxi industry is perfect. Far from it. However, we need to recognize that many of the flaws of the industry are a direct result of the industry trying to remain compliant with an ever more restrictive regulatory environment. Some of those regulations exist for (what I hope are obviously) good reasons: to assure the fleet is safe and reliable, to assure drivers are trained and safe, and to assure the industry is accessible. There are other regulations that appear to exist in order to protect the viability and sustainability of the industry and/or to protect consumers, including regulated prices/meters, and limits to the number of vehicle licences that can be used in any given region. Some of these regulations make sense only in a government-regulated industry sense, to prevent operators from ripping people off or undercutting each other, which may impact safety. The cumulative impact of these regulations is an industry that is inflexible and at times horribly inefficient, but for the most part safe and reliable with predictable pricing and a constantly-updated fleet. The workers are not getting rich, but can make a decent predictable living, and the owner of the companies are providing a service, paying their taxes, and mostly succeeding, while the incentives to compromise on safety or service by undercutting your competition are few. Depending on whom you ask, they are doing this in spite of – or because of – the grey-market taxi licence sub-industry that puts 6- or 7-figure values on every licence they own. But that market is (and I cannot stress this enough) a product of the regulatory regime forced on these operators and owners. Uber, in contrast has ignored these regulations, and have leveraged this lack of a fair playing field into a multi-billion dollar enterprise. Their service has the advantage of being more flexible and (usually) efficient, leveraging a remote “rating” application in an attempt to assure higher levels of customer service, though this process alone creates problematic workplace conditions. They do not have employees, but instead have millions of independent contractors who have no control over the terms of their employment, but bear all of the costs and risks of that employment, which is not in keeping with modern employment practices in a post-industrial society. It is not clear who is paying taxes and where, whether an Uber driver is insured in the event of a crash or other incident, or who is assuring the vehicles are safe for operation. Uber spends a lot of money on lawyers assuring they hold no liability for the actions of their “employees”, fighting the established legal principle of vicarious liability. There are no standards of accessibility for their fleet, and pricing is often unclear. Drivers are not required to have Class 4 drivers licences, may not have criminal record checks, and may not even be legally entitled to work in the jurisdiction. Now, I’m not saying that none of these issues are impossible to address, nor am I defending the complex regulatory environment that currently makes the Taxi industry as frustrating as it sometimes is. 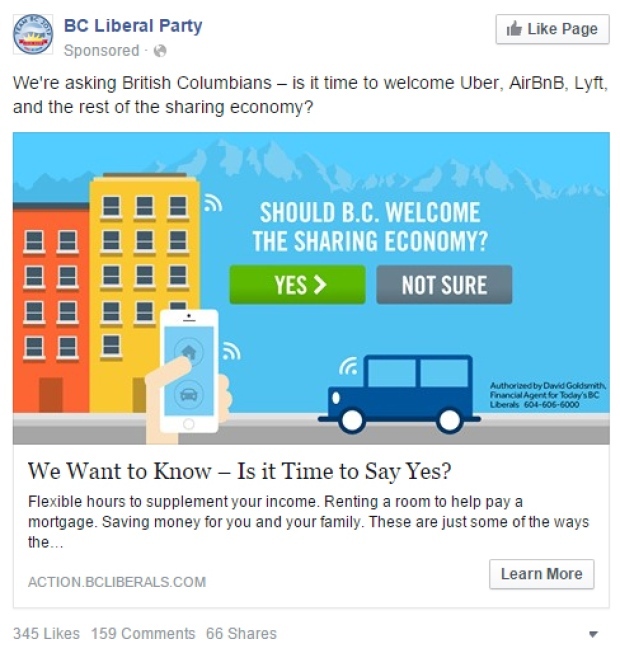 This was made apparent to me back in the spring of 2015 when two taxi companies operating in New Westminster applied for more licences, citing the need to fulfill the expectation of their customers in regards to availability and wait times. The two companies applied for a total of 17 new licences, and were given 4 by the Transportation Safety Board. Council of course rubber-stamped the approval after no negative public comments, but the fact the industry sees the need for 4x the number of new vehicles than the provincially-regulated Board is willing to grant demonstrates that the regulation may be as much of a problem as it is a solution. The Minister of Transportation has spoken out against Uber in the past, even threatening to send in investigators and file charges under the Act if Uber is found to be operating in the province. But as of this week, there appears to be a shift in thinking on this file by the Premier and the Minister, and excuse me for being a little skeptical about the motivations. This week, the Premier, the Minister, and a candidate in a Coquitlam By-election have come out with announcements showing varying levels of approval of the Uber model. The Minster even saying it was a matter of “When, not if” Uber comes to BC, but there is nothing on the Ministry website suggesting any recent change in ideas about Uber, and their decidedly non-favourable Factsheet on the topic has not been updated in 6 months. So if a conversation in the Ministry is being started about this, it isn’t a public one. You need to submit your name and contact info to take part, and as this is a Liberal Party ad, not a government document, it is simply a method to collect contacts for targeted Get-Out-The-Vote action in May 2017. There is nothing unusual or illegal about this, but it is telling that the Government is (in their official role) telegraphing movement on this at the same time they are (in their political role) collecting the names of people who like the idea of the change. This tells me that the Liberals anticipate Uber being a wedge issue during the 2017 election, and are assembling their resources for that fight. No doubt the Premier’s former campaign coordinator, who is now paid to lobby the government on behalf of Uber, is part of this planning process, and will know how to leverage the needs of his employer(s) to the utmost political advantage of all. It already appears that the paid comment-section spammers “digital influencers” of the Liberal Party have been characterizing the NDP as dinosaurs, old fashioned and “proponents of videos stores” if ever they call on the Government to show some actual leadership on this file with revised regulations, so that should be fun to watch. Which makes me suspect that the regulation of “the sharing economy”(ugh) will end up much like the gradual and ultimately irrelevant shifts in liquor laws over the last few years. There will be little useful policy developed and little real change, but a lot of press releases to sell small populist victories at times when the Government needs some good news. And if Uber never arrives in the Lower Mainland, somehow the blame will be shifted to “lefty” cities like Vancouver and New Westminster, despite our lack of regulatory jurisdiction. But to prove I am skeptical, not cynical, I hope this does not occur. I hope that this forces the Government to take a serious review of the taxi industry and employment standards in the “ride sharing” industry, so that workers and consumers in both industries are protected, and can make clear, informed, choices about their options. And also hope the Government put as much effort into planning and developing those regulatory changes as they clearly are in marketing the political battle to come. Posted on January 20, 2016 January 20, 2016 . by Patrick Johnstone. Leave a comment. This week’s council agenda was not a long one, but we covered two topics that are a big deal for a lot of volunteers in the City, and quite a bit more. This is the best of reports, and the worst of reports. Pretty much every Committee and Commission has more applicants than spaces available, and sometimes many more. It is hard to balance refreshing the committees with a few new faces and keeping the people who have contributed in previous years in order to maintain some continuity. However, it always means saying “no” to many excellent applicants and many valuable contributors to the previous committees. So if you applied and got selected, congratulations, and recognize that there were others who applied who were not chosen, so please come to the committee with an open mind, a strong voice, and a willingness to contribute. For those who were not chosen, please do again next year! We would choose you all if we could, but Terms of Reference need to be respected and in my experience, a too-large committee gets ungainly and reduces the opportunity for individual members to have meaningful input. Here is the list of the selectees, thank you all for your applications. Let’s get some things done in 2016! A couple of the Committees did have a one-time extension of the terms of reference in order to accommodate a few extra members, mostly because of unique skill sets that would serve the Committee’s mandate well and the desires of the chairs of those committees. This is subtle adjustment of the Terms of Reference of the Heritage Commission so that membership can be split into offset two-year terms to allow overlapping terms and create continuity on the Commission. This is the ternary report on the things the City bought and paid for in the last 4-month period, which allows us to track if we are hitting or missing our budgets. It also provides a bit of Council (and in turn, public) oversight to the procurement process, and is actually an interesting read if you wonder what your taxes are spent on, and why. The City passed a Bylaw back in 2012 authorizing us to borrow $59 Million for various purposes, including work on the Anvil Centre and numerous roads, parks, and engineering projects ongoing in the City. In the end, the City was conservative in their borrowing and careful with their spending commitments, and only borrowed $23.5 Million, less than half what was authorized. Of that $23.5 Million we borrowed, $11 Million is within our 5-year plan to be paid back, which classifies it as “short term borrowing”. The balance will not be paid back until after 5 years, and therefore staff require authorization to borrow $12.5 Million over the long term from the Municipal Finance Authority. This is not new borrowing, just proper accounting for previous borrowing, as the legislations requires of us. We had a report on the one of this Council’s priority projects, turning the planned re-development and expansion of Royal Columbian Hospital into an economic driver for the entire City. This means assuring the expansion supports the economic development of the Sapperton neighbourhood, while we manage issues like parking, traffic, and development of commercial areas like the last phases of the Brewery District to best protect the livability and viability of the neighbourhood. We can leverage multiple advantages – the proposed District Energy Utility, the proposed dark fibre that will form the backbone of our Intelligent City Initiative, and the potential for renewal of the Rousseau Triangle, the Braid Industrial Area, Sapperton Green and even some underperforming parts of East Columbia. At least that’s the hope. Like the rest of the City, Transportation is a challenge in this area, and internal connectivity is the most pressing issue. We need people to be able to move around in the neighbourhood safely and comfortably as a first priority. East Columbia cannot accommodate more vehicle through-put if it will be a great street at the centre of this economic cluster and a fully accessible safe pedestrian realm. It needs to be That connects the Hospital to the parks and businesses like an open mall, and the pedestrian movement through the Hospital Campus is a major part of that. We las need to connect the Rousseau Triangle to the hospital site and East Columbia with a similar concern for safe, comfortable pedestrian travel. And we need to make it safe to cross Brunette and the railroad tracks in order to connect the Braid Industrial Area to the rest of our community. Currently, there is a 1.3km stretch of Brunette – from Debeck to Braid – where no person can safely cross the road or tracks. That is a huge barrier slashing right through the middle of our City that is killing the value of the land and the opportunity for better land use on both sides. So these are some of the challenges, but the opportunities are big, and we need to assure we have the pieces in place to make the best plans viable. Council moved to receive the roadmap outlined in the report. The City is still working on the process to grant both cash and “in kind donations” (City expenses for things like engineering help and policing that the City pays on their behalf) to organizations across the City who put on festival type events. Last year, the city granted $188,000 in combined cash and in kind to the organizations. This year’s budget was increased to $210,000 and we received requests for $341,000. The festival committee reviewed the requests and recommended increasing the grant budget to $272,000. There are two items that are appearing on these requests for the first time, which we had previously paid for out of other City budgets, and are only moving over to the Festival Grant budget to make it more transparent what we are spending. Those are the $36,000 the City provides for May Day events, and the $21,000 we provided for support services around the Hyack float. So that $57,000 is not new spending, but just moving columns in the budget. I share some of concerns of other councilors about ever-expanding budgets for festivals, and I’m a guy who loves festivals. I would love if we could open our streets more in the summer and have an event happening every weekend to get people to spend time together celebrating our City. It would be a huge boost for the City and for the businesses. But it costs us $20,000 to open a street for a day, and we need to assure that brings us value. I liked where the Mayor was going in his comments (at the risk of putting words in his mouth here), in that we need to better separate the costs related to opening a street (and granted through this process in kind) and the actual cash we give some festival organizers. The former (in kind costs) we should be doing on the basis of whether we think the festival is a benefit to the community consummate with those costs. The latter (support cash) should be used to provide the smaller organizers with less access to sponsor money some vital but modest support, and possibly providing some seed money to help with the start-up of larger events, with the intent that those larger organizers build sponsorship capacity and move away from relying on City cash to be successful. We will be having further discussion about this in the year ahead, and will hopefully tune the process a bit for the 2017 granting window, but the organizers for 2016 have been waiting a long time for Council to move on this issue, and the Festival Committee has done a good job, so I was happy to move their recommendation. The City’s Engineering Department is working on implementation of the Master Transportation Plan, and have provided a report on the progress so far, and the plan for what parts of the MTP will be implemented or initiated in the next 4 quarters. The targets are good ones, and reflect progress towards making our MTP successful. This is a transportation strategy that serves the livability of the community first. The goals are to make the Streets and sidewalks safer for all users, to encourage lower-carbon and more sustainable transportation options, and to protect our neighbourhoods while reducing the cost of maintaining our roads. Some of these things seem small, but make a big difference in how accessible our community is, such as out commitments to prioritize curb cuts, sidewalk expansion and making every bus stop accessible. We are steadily working on improving the greenway network by identifying the gaps or barriers that need to be linked up. We have at ACTBiPed been talking a lot recently about downtown, and how to make the hills less challenging through connecting favourable lower-grade pieces of road. But these are the things you see, what you don’t see is a bunch of the work that is being done to review how traffic signal timing operates in the City, reviewing how we collect and share traffic data, or the corridor and parking studies we are doing in different parts of the City. And we are working with our regional partners, TransLink on Pattullo plans, Coquitlam and the Ministry of Transportation on the Brunette overpass improvements, BC Trucking Association and the region’s mayors on major transportation funding and things like tolling policy. It is an exciting and busy time! But consistently, transportation is the #1 issue in New Westminster, and will be for years to come, because the overall congestion problem is regional and the solutions rely on us working together. It’s no secret I am a big fan of the Royal City Farmers Market. Not just because it is a great way to access fresh local food, or because if creates a community get-together every time it runs where connections are made, but because the enterprise from the start has operated not just as a not-for-profit, but as a social profit. It cranks so much back into the community, working with the schools, Family Services, Seniors Services, Arts Council, Spirit of the Children, etc. etc. They contribute so much to the fabric of the City, and they do it with intention. All this ,and I get to give my money every week to the local person making the food I am buying, which is incredible in today’s consumer world. Council has discussed some ideas to reduce the in-kind costs the Market is paying to make it more sustainable, and these will be coming back to Council next meeting. The second partnership is for ACORN to run tax return assistance programs for low income people with barriers to help. This is one of those things I feel we need to support because it is a gap senior governments simply fail to fill for the most vulnerable in our community. I wish we didn’t have to support this, but I am secure that the money we invest in this program is returned in multiples to our local community, while making life easier for very vulnerable people. This is a preliminary review of a potential rezoning for a piece of land in the “Rousseau Triangle”, which you might know as the 100 Braid Art gallery, the Laser Tag facility, and a third property. The proposal is to see the westernmost building replaced with a new school building to house Urban Academy (currently located on the edge of Queens Park, but you already know about that). The rest of the property would eventually be redeveloped into a higher-density mixed high rise (20 stories) and multiple-townhouse residential development. This came to the Land Use and Planning Committee, and a few concerns were raised, including the ubiquitous traffic and parking, and how the existing buildings on the site would be re-purposed (or not). There is much more work to be done on this project, and it will eventually go to Public Hearing, so I won’t dig too deep into my opinions are, but I am happy that this is going to community consultation, and look forward to hear the results of that consultation. We then (after a short recess) had some interesting Open Delegations, one looking forward to a better relationship with the Port, one looking back at the remarkable history of marketing in New Westminster, and one introducing an exciting year of Parades for the float we funded earlier in the evening. 2) We had a bit of an update on the Kinder Morgan Trans Mountain Expansion Project NEB Hearings. As discussed above, this Bylaw adjusts the terms of Reference of the commission, and we gave it three readings. Posted on January 17, 2016 . by Patrick Johnstone. Leave a comment. Now I very much feel like we got something done. My first year on Council has been busy, with some really important stuff, though we were at times distracted by issues that have less impact on the long-term viability of the City. I wonder, sometimes, if we are just kicking the can down the road, or are we actually getting things done? Intellectually, I know it is the latter, I recognize that we are moving so many things forward (Canada Games Pool, Front Street, OCP, whistle cessation, etc. ), and just because we are not cutting ribbons every day, the work we do on them now is as important as the closing date will be. However, it feels good to get one big box checked off in my personal to do list, and the Tree Protection Bylaw was a big one. Of course, *I* did not do this. It was the result of a lot of great work by City staff and an excellent consultant team. Council as a whole provided direction and political support, so this is progress for the City of which my part of the team was pretty small. But just like the guy who sets the football for the place kicker, I am happy to be part of the team that did something the City will be proud of in the decades ahead. A Tree Protection Bylaw is something I have whinged about for several years, and New West is hardly a leader in this front. The Bylaw we have adopted is, in my opinion, well developed and pragmatic, and reflects the best practices of other cities across the region. •You need a permit to cut a tree down if that tree’s trunk is larger than 20cm in diameter at chest height, or if that tree is otherwise designated as “protected”. •If the tree is hazardous or its roots are causing damage to buildings or utilities, you can remove it, as long as you can demonstrate it is problematic, get a permit to remove it, and replace it with a less-problematic tree. •If you cut a tree down without a permit, or damage it to the point where it dies or becomes hazardous, you will get fined, and will be required to replace the tree. There are devils in the details here (i.e. when does a hedge become a tree?) that are explained in the Bylaw, and you can contact the City to get those details if need be. Lots of information is available here. The other aspects of the Urban Forest Strategy we adopted on Monday are just as important as the Tree Bylaw. The City is making a commitment to increase the tree canopy over the City from 18% to 27%, which is the North American Standard. To put that in context, the Queen’s Park neighbourhood has about a 33% canopy coverage, where Sapperton and Glenbrook North have about 19% overall. If we imagine every neighbourhood being as leafy as Queens Park, you have an idea how much this will change the livability of our City. There is no doubt there will be costs to this ambitious strategy, but there are significant opportunities to offset some of those costs, and the long-term cost/benefit of a healthy Urban Forest has been proven to be positive across the country. The aspirational goal of 10,000 more trees in 10 years is going to impact everything from what types of housing we will be able to accommodate in our upcoming Official Community Plan, to how we design and protect our boulevard spaces and parks. The implementation of this strategy will be over 20 years, which demonstrates that even with the check in the box for a big progress step, there will always be more work to do. Posted on January 16, 2016 . by Patrick Johnstone. Leave a comment. I am really happy we have finally reached this point. This is a process that started long before I joined this Council, but I did attend several of the early public engagement meetings and workshops, and had many conversations on the doorstep while running for Council about the importance of taking concrete measures to protect trees in our City. I thank staff and our consultants for putting together both an impressive body of research on the existing urban forest in New Westminster, and a solid 20-year plan to shift us from a place where the urban canopy is being eroded to one where trees are valued as an important part of our everyday urban environment. Few things impact more the health and vitality of an urban community than the presence of trees. And the next generation of New Westminster residents will be the biggest beneficiaries, as the old saying goes: The best time to plant a tree is 20 years ago, the second best time is today. This is also timely, as the loss of trees in the City has been accelerating, and as we see more development pressure, and start talking about creative ways to accommodate the pending population growth through or new OCP, this Strategy will assure that tree protection is part of that planning, and that aspect of the livability of our neighbourhoods will be preserved. I’ll write another blog post about this topic, suffice to say Council endorsed the Strategy unanimously. We had an open delegation from a representative of the the Taxi industry talk to us about Uber, and members of Council were pretty clear where we stand on the issue: Between the Province and Uber, there needs to be some agreement on how to regulate the ride-for-hire industry. I will have to go on further about this in a follow-up post, but I have concerns around employment practices, safety, taxation, and accountability. Previous to coming to Council, the Land Use and Planning Committee had a really good conversation around this study, and the presentation from neighbourhood residents who lead the study was really advantageous to Council better understand the Community desires here. There are many ideas that come out of the Study, and we need staff to do some work and need more public consultation to evaluate ideas in our local context. For example, providing the “California Mills Act” model of tax rebates are preferred by some, but it is unclear if that is even legal under the Local Government Act. The most important take-away, however, is that the Queens Park neighbourhood appears ready, even willing, to provide a more proactive protection regime to conserve the neighbourhoods important heritage elements, and I think that is a good thing. This is a Heritage Revitalization Plan and heritage designation for a rather unique house in Sapperton. Council moved to send this to First and Second Reading. This project will go to Public Hearing on February 29, 2016. C’mon out and tell us what you think! This request came from the Advisory Committee for Transit, Bicycles, and Pedestrians, (ACTBiPed) following on our now-traditional summer walking/rolling tour. This year we looked at 10th Avenue above the West End, and identified issues in how the existing cycling and pedestrian crossings work (pretty poorly, unfortunately). As there are currently some pending plans on the Burnaby side of 10th Ave to re-develop the old Safeway Warehouse and surrounding area as “High Density Mixed Use”, with re-alignment of the transportation corridors, it is a good time to make sure our established greenways through the West End align well with Burnaby’s long-term vision. The Lawn Bowling Club leases their land from the City, as they have for 66 years. Every few years we need to update and sign a new lease. Council approved the new lease. Did you know the New Westminster Lawn Bowling Club is not only one of the finest such clubs in the Lower Mainland, with a reputation for the highest-quality natural grass greened in the region, it is now in its 99th year of operation as a Club. Every time I have attended an event there, it has been an inviting, friendly, and fun atmosphere. And the sport is easier than curling to learn, but just as hard to master. You should try them out when they have their learn-to-bowl events in the spring. There are some things we need to buy, part of our long-term capital budget, that we need to approve prior to the official Capital Budget period, because delaying will result in a loss of service. A good example is heater repairs for Moody Park Pool – if we wait for the regular budget cycle, the heater will not ordered, delivered, and installed until September, which kind of limits the use of the pool. Councillor Harper pointed out one interesting aspect of this report – the drop in the Canadian Dollar means we are going to have to pay 30% more than we expected for the replacement turf for Mercer Field. That extra $300K is really going to be noticed in our annual capital budget, and it is not the only thing we need to spend money on that will come with a dropping-dollar premium. Something to watch when our Capital Budget discussion begin in earnest over the next month or two. The City is working on a policy to allow Food Trucks to operate on our commercial streets. Staff have done some research and outreach, and presented us their preliminary ideas. The results show the public is generally in favour of this initiative, although there clearly needs to be a policy in place to address some of the concerns, especially from brick & mortar businesses that pay taxes every day in our City. Practice in other jurisdictions shows that Food Trucks can do a lot activate public space – make your streets and sidewalks more “sticky” and attractive to people who will then go on to support other nearby businesses. This could be a great addition to the other things we are doing to activate our streets, from Parklets to seating areas and a general increase in the diversity of our pedestrian realm. They create interest and add to the impression that the streets of New West are a place to be, not a place to pass by. That will benefit all businesses in the City, and the residents of the City. I think the policy provisions introduced here support that goal, and balance well the needs of our established bricks & mortar businesses. Council voted in support of taking this to public engagement ASAP, and I hope we can get a policy fully developed and in place in time for the Summer 2016 season. I added this to the agenda, as we had received a request to use the LED lights at the Anvil Centre to “Light Up Purple to support Provincial Eating Disorder Awareness Week”. We are beginning to receive more of these types of requests, and I would happily support them, but this is local government, so we need to develop a bit of a policy around them so that Council can approve what we “support” or don’t, and the related costs are put through the proper scrutiny. The first issue should be obvious, if someone wants to light up a City building to support something inappropriate or offensive (say, the Habs winning a Stanley Cup), we can prevent that embarrassment. We also need to make it simple and obvious how a person or organization would even make the request. Random e-mails to Councillors is probably not the best system. I was surprised to find it actually cost quite a bit of money have a lighting consultant come in and do the work to adjust the lighting scheme for the LEDs at Anvil. I simple-mindedly assumed a building maintenance person could just flip a switch or two. So, like so many other things in local government, Staff will be reporting back. There are (unconfirmed) reports that the victim of the pedestrian fatality last week on east Columbia Street had some mental health issues and had contact at Royal Columbian Hospital prior to the incident. Council requested a report from the Police on this incident to determine if there is any follow-up warranted by Council. These Bylaws support the heritage restoration and protection of 335 Buchanan Avenue in Sapperton. Council gave these Bylaws two readings. We made changes to the Arts Commission terms of reference in a previous meeting, and now we formally adopt the Bylaw supporting those changes. Adjust your behaviour accordingly. And after reviewing a bit correspondence, we were done for the evening. *NOTE: Council held a special meeting on Wednesday, January 13 to Adopt the Tree Protection Bylaw and make the changes to the related Bylaws Final. Tree Protection is the Law Of The Land, folks. Adjust your behavior accordingly. Posted on January 13, 2016 January 13, 2016 . by Patrick Johnstone. 6 Comments. There was perplexing opinion piece in the Vancouver Sun on Monday that referenced the City of New Westminster’s efforts to perform public outreach as part of its Official Community Plan process. Unfortunately, the writer (a New Westminster resident) seemed to take the position that the City was trying to sneak a bunch of changes through in defiance of our residents, and that any evidence of consultation is either “dilly dallying” with “fairy tale jargon” or evidence that planning is sprinkled in “pixie dust”. It started with the complaint that a Dog Park had been added to Moody Park without her consultation. After two years of public calls for a dog park at that location and more than a year of open houses, council meetings, postings in the local paper, attendance by paid City staff at several Residents Association meetings, on-line call for input on the City web page, poster advertising at key park locations, stories in the local paper, draft models of various layouts, letters to the editor for and against, and a public survey that received more than 450 responses, apparently the City had not done enough to warn her that a pretty common amenity was being added to a park near her home. That sort of sets the stage for the 900 word whinge to follow. I cannot even understand what she is saying here, but it seems to suggest that, previous to this OCP, there was no previous OCP, or even zoning. It seems the writer imagines no previous city regulation or planning process shaped our community, and that somehow planning for any change will not only hasten it, but make it “artificial”. Perhaps it is a call to freeze all change in the region, because she has her “leafy enclave” and somehow those thousands of (current and future) New Westminster families who cannot afford adequate housing should just move into a lean-to by the river… you know, keep things “organic” like they used to be. It’s nonsensical. For the record, the City is required by Provincial legislation to have an Official Community Plan, and to update it on a regular basis. Our current one was first developed on 1998, and has seen a significant amount of (ahem) organic evolution over the last 18 years. It is time for an update, because things have changed since 1998, not the least being a significant shift in the Metro Vancouver real estate market, and in the demographics of our community. Do you want to know what bugs me enough about this article that I am writing an lengthy retort? Is it the laziness inherent in the lack of fact checking? Is it the failure of a person whose job it is to inform people to provide any useful information? Is it the condescending language and entitled whingy spirit of the piece? No. What pisses me off is that the writer is somehow both ignorant and contemptuous of the incredible job that our City staff have done over the last two years making something as dull and arcane as an Official Community Plan update into something that people from across the City have found engaging, interesting and rewarding to take part in. Our staff have developed a comprehensive outreach plan unprecedented in the City, have created hard copy and on-line resources, have found a huge variety of inspired ways to take these materials out to the places where people are, and have begged and pleaded for people from across the City, from different walks of life, from different family and housing stages, to provide input. And the citizens of this city have responded in an equally unprecedented way, showing up and taking part in big numbers. More recently, a similar multi-hour open workshop was held to discuss different housing forms, the opportunities and challenges, and to discuss how or where different forms may fit, on a neighbourhood-by-neighbourhood basis. More than 150 people attended this day-long event. Besides the native advertising of just being in your face at every community event over the last two years, staff have advertised on the City website and the City Page in the local newspapers, have purchased other newspaper ads, have put up posters at all City buildings (City Hall, Community Centres, the Library, etc. ), have performed mail drops across the City, have even hand-delivered in some neighbourhoods where the mail drops were less effective, have used the illuminated billboards at every entrance/exit to the City, Facebook Ads and newsletters. They even arranged to have the School Board provide notices for every student in the district take home to their parents. Personally (and I am not alone on Council here), I have tried to spread the word in any way I could. I helped organize an open house that brought together 50 young professionals – engineers, architects, chefs, software developers, marketing gurus, people with young families worried about their future housing needs and affordability, most who don’t traditionally take part in “City open houses” about planning issues. We got together at the River Market for a 2-hour workshop on housing types and density, and they provided incredibly varied, intelligent, and valuable input. I have written several blog posts, including one with step-by-step instructions on how to complete the City’s on-line engagement portal. I have attended dozens of workshops, open houses, and community meetings – not to do the job of staff in explaining the process, but just to hear what people are saying in response, and to encourage people to provide feedback directly to the City in any way they can. With the exception of the one meeting Christopher Bell kicked me out of because he felt he couldn’t have a “frank discussion” with me in the room, I heard valuable and sometimes surprising input, and have learned a great deal about the diversity of opinion in the City. So if the author’s complaint is a lack of public engagement, my question is – what would she have us do? Because we are ready and willing to do whatever we need to in order to get a better sampling of the community. And the job is not done, as there is a bunch more public consultation to come. There are three more open workshops, January 30, February 6 and February 13, one of them only steps from the Dog Park of Concern. They are open to everyone – but it is way helpful if you register ahead of time so we know how many chairs to have and how much materials to prepare (you can even review the materials ahead of time). These are in the middle of a weekend day when most are available, and there will be both free childminding to make it easier for families to participate, and foodtrucks on site in case you get peckish during the three-hour event. We really want to remove any barrier to you attending. There is still the on-line survey, and if you take a bit of time to fill it out, it is actually quite fun and interactive. If you want a step-by-step guide on how to complete it, I tried to throw one together here. Let me know if you need more help with it. If the on-line thing isn’t for you, and you want paper copies of the materials to mark up and send in with your suggestions, or if you have a group of people who would like a little more guidance to help go through the materials so you can provide feedback, you can Contact the City Planning Department (email ourcity@newwestcity.ca or phone 604-527-4532) and they will do that for you. Or contact me (see contacts below) and I’ll arrange it for you. And of course, any comments you have, good, bad, or otherwise can be sent to the Planning Department above, or to Mayor and Council. If, somehow, you have missed all of these opportunities to provide input, and still want to comment on the OCP, there will be another entire round once the framework of a new OCP is developed. Which is another point Ms. Fralic could have fact-checked: Up to now, we have been collecting people’s input into what they want to see, and we have (as part of that) put a few very draft concepts together, but we have not yet created a new comprehensive plan. Everything you have seen so far (and this was made explicit by staff at every event where they were presenting) is pure speculation used to provide media to gauge public opinion. It is not the actual plan for a new OCP. Because we are too deep into public engagement for staff to have developed that yet. The draft land use plan for a new OCP will be developed by staff this spring, and if it passes a first trip past Council, it will again go out for more public consultation. You will, at that time, again have the opportunity to come to public meeting, read materials on-line, provide feedback by computer, by mail, by phone or in person. Posted on January 10, 2016 January 12, 2016 . by Patrick Johnstone. Leave a comment. I am just back from Vacation, and I am still trying to understand where the Royal City New West Record newspaper is coming from when they emphasize an alleged clash between the “New” and “Old” communities in New Westminster as their Story of the Year. Perhaps I am being obtuse, but it seems to evoke the divisiveness of the Old Stock Canadians dog-whistle message quoted in the article’s lead, and I simply disagree with the premise. To suggest that “younger folks and families” filling new condos are somehow different than families living in houses is not only a false dichotomy, it creates an impression that one is better or more important than the other, and that somehow people (especially, as continually suggested in the story, the City’s government) are picking sides. It belies the reality of how mixed and diverse our City is, and how much blending there is in those two alleged camps. I’m a resident of Brow of the Hill, not born in New West, but feeling very connected to this community I live in a house across the street from numerous apartments built in the 60s and 70s, predominantly full of renters, some more connected to the community as I, some less. On one side of my house is a family of “younger folks” who moved in at the end of 2015 after a decade of living in Vancouver, although one of them grew up in Queens Park and graduated from NWSS – are they “Old” or “New” New West? What about the retired couple across from me, one of whom was born in the BC Interior (like me) but had a career working for the City of New Westminster? I have friends who live in a condo on the Quay that has a demographic not far from your typical retirement village, I know young families filing more-affordable single-family homes in Queesnborough, some second-generation Canadians who first learned English at Queen Elizabeth Elementary, others the children of families that built Queensborough generations ago. Who has the hubris to draw the line between “New” and “Old” New West within this mix? Why would we want to? Because between “New” and “Old” New West is a huge and growing number of “Middle Age” New West, those who have been here for a few years, or a few decades, and despite having not been born here, they have put down roots and are making New Westminster home. And they are raising a new generation of New West. At the the suggestion of conflict, most would say we are all New Westminster, whether our grandfather was born here, or we arrived as a refugee last week. Our success as a community will be found in supporting each other, and embracing the diversity of our community. As the great Jane Jacobs reminds us in her treatise on vibrant neighbourhoods and cities, a diversity of people, families, buildings and activities are what create an economically viable and culturally sustainable community. Only that will make us strong enough to withstand threats external or internal, and avoid the stagnation that too often follows on the heels of urbanization. Just as we cannot stop innovating, we cannot throw away what is established, we need to make them work together. So if building a great community means accepting all types of people sharing and working together, and if the line between “New” and “Old” is so fuzzy, what is to be served by trying to insert arbitrary lines, creating arbitrary categories, and watching for reasons for them to fight? Through all those times, transitions, and shifts, which should we stamp as the optimum, the one we must not move away from? I know I can’t make that call, and it would suggest it is silly to try. Because over that time all of our strongly-held traditions have adapted – including the oft-cited example of May Day. A couple of years ago I wrote a blog post about a study that outlined many of these “transitions”, including the way May Day and the festivals around it have changed, sometimes back and forth, based on the economics and attitudes of the day. Most interesting to me was the part that talked about a new upstart group of young business leaders who came in 40 years ago and re-drew a bunch of traditions to modernize the City’s May festivals – the group that came to be known as the Hyack Festival Association. I only use this as an example, and don’t want to dwell on it, for fear I am playing into the narrative that I don’t believe. Far from suddenly transitioning to a New New Westminster, we are continuing to evolve. I love some of New Westminster’s “Old” traditions (the Anvil Battery Salute? Who can’t love that?) and am completely uninterested in some others. I also love some (not all!) of the “New” traditions being developed (PechaKucha Nights!) and hope they survive to the next generation. Of course, in between there have been many Traditions that have come and gone, and some in that intermediate stage between “Old” and “New”. Some people like the RC Musical Theatre, some like the Symphony, some like comedy at the Columbia and live music at the Heritage. I think the Royal City Curling Club is a 50-year cultural and sporting tradition in the City that not enough people appreciate, but to love it doesn’t take away from the legacy of the Salmonbellies. Why do we have to choose and put ourselves in camps? We are all New Westminster. So let’s keep embracing the things we love, and not be afraid to try new flavours. Because it is the combination of “New” and “Old” that makes us special, not an alleged conflict between them. Posted on January 9, 2016 . by Patrick Johnstone. Leave a comment. I took a vacation. After a busy but very rewarding year with too much work, a too-stuffed schedule, and too little recreation time, it was good to get away for a couple of weeks and chill. Of course, I read some books about urban planning (reviews soon, if I get time) and spent a lot of time looking at the urban realm while tracing the career path of Peter Stuyvesant. Here are three thoughts. 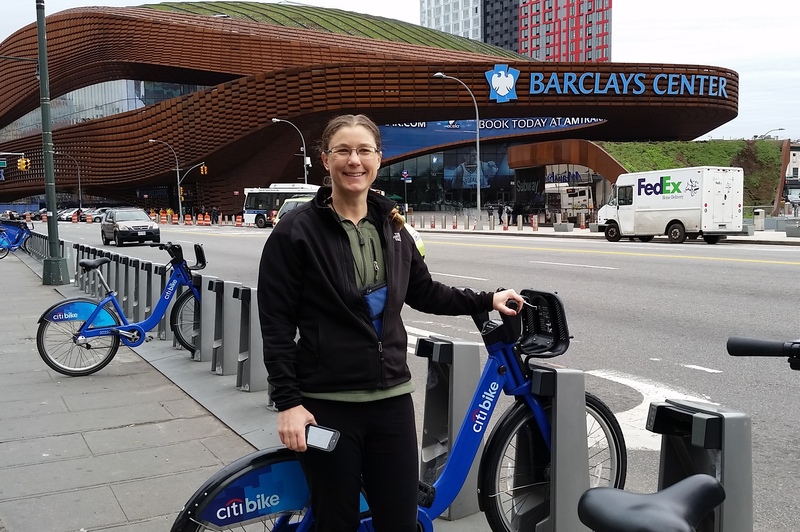 This is New York’s bike-sharing program, and while spending an unseasonably warm Christmas in Brooklyn, we had an opportunity to spin around on the almost-ubiquitous blue bikes. The bikes themselves are sturdy Dutch-style upright bikes with full fenders, enclosed chains (no grease to worry about), simple but effective three-speed internal hubs, drum(!) brakes, and hub-generator powered lights. Tough? The bikes are (to paraphrase Neal Stephenson) “built as if the senseless dynamiting of [Citybikes] had been a serious problem at some time in the past”. They are pretty much a perfect balance between bulletproof and efficient. There are many options to pay, from paying for a single ride to buying an annual pass. We bought a couple of 24-hour passes for $10 each. This gave us unlimited access for 30-minute rides. 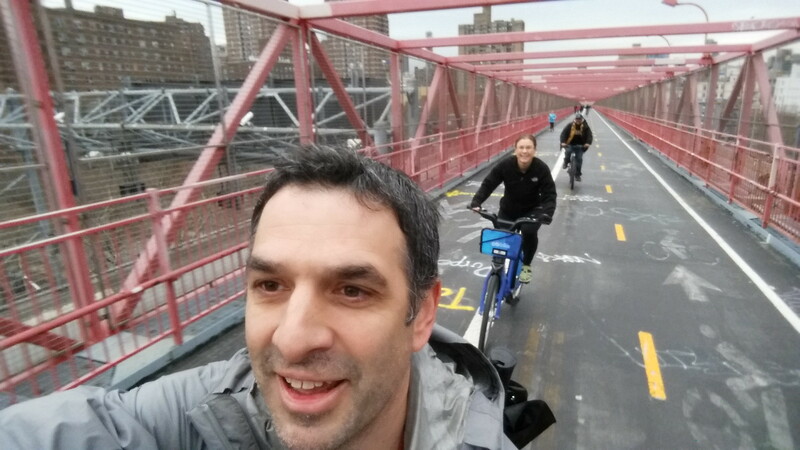 We were able to ride from our apartment in Bedford-Stuy to Barclay Centre, then from Braclay to downtown Brooklyn. Dropping bikes at a convenient station (you are never more than a 5-minute ride from a station within the service area), we walked across the Brooklyn Bridge, wandered around a bit in Manhattan, picked up a couple of bikes in Little Italy, rode across the Williamsburg Bridge, dropped bikes and visited a microbrewery, etc., etc. Actually, bulletproof and efficient pretty accurately describes the entire system. The kiosks and payment process is simple to use, and features a little digital map you can scroll around to navigate your neighbourhood, the on-line app will guide you to the nearest station (if your 30 minutes are running out), and there are very few surprises. Is the system successful? 10 Million individual rides in 2015, and ongoing expansion plans to reach 12,000 bikes and 700 stations by 2017. Before anyone talks to me about my helmetless pictures above (Hi Karon! ), there is no helmet law in New York, and with literally tens of millions of rides since its inception 2013, there has never been a fatality or a serious injury on a City Bike. Looking at NYC’s pedestrian and traffic fatality stats, CityBike may be the safest way to travel in the Big Apple. Yet, globally, no jurisdiction with a helmet law has successfully launched a bike-share program like Citybikes. Every one has failed, or failed to launch. And I predict Vancouver’s will fail for this very reason. 2. Even in New York, pedestrians are serfs. Walking Fifth Avenue from Central Park to the Empire State Building is an incredible experience. From the Plaza, past the Library and Rockefeller Center and St. Patrick’s Cathedral, through the (unofficial) centre of world shopping, it is a spectacular combination of sights and sounds and people and shopping and urban buzz. A couple of days after Christmas, I got to share it with tens of thousands of other people. It got rather more intimate than most would probably like, because all of those people were crowded behind barriers on too-narrow sidewalks as hundreds of police spent their holidays keeping the vast expanses of asphalt between the sidewalks free for the movement of – a couple of dozen cabs and towncars. Just look at this photo and look at how the public realm is divided up. 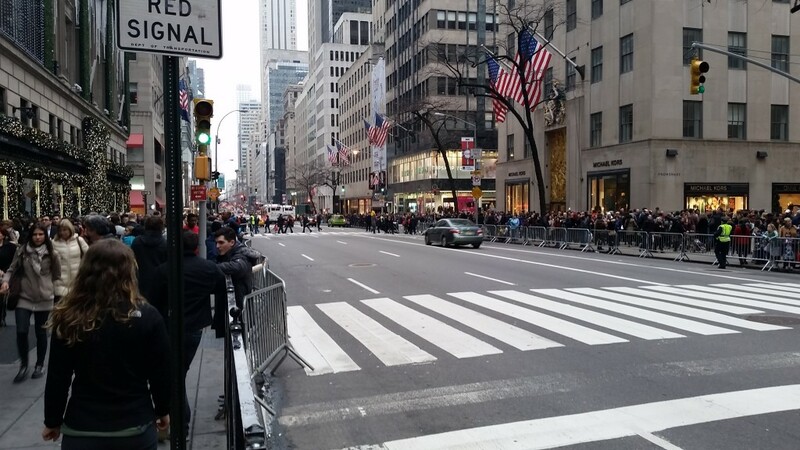 4m sidewalks, 20m of road, and look at where the people are. Overall, New York City is one of the most walkable places on earth, and between the incredibly convenient subway system (although, I noted only about 10% of station were accessible for people with disabilities! ), short distances to get any kind of shopping you might want, and a huge reliance on walking as the primary form of transportation – the guy in the town car somehow gets priority to an opulent amount of the public space. It’s bizarre. 3. Aruba may be the Netherlands, but it ain’t Dutch. We picked Aruba for our vacation because we didn’t want adventure this year, we just wanted to chill on a beach, and according to legend, Aruba’s beaches are amongst the best. A legend I will whole-heartedly confirm. However, we were also intrigued by Aruba’s Dutch heritage (it is still part of the Kingdom of the Netherlands), and hoped to see a little of the Dutch personality of the island. Unfortunately, aside from ubiquitous Heineken and plenty of young Dutch nationals working the tourist bars and restaurants, there was not a lot of Amsterdam to be found in Aruba. For a small island with incredibly pleasant weather, It was a depressingly car-oriented community. We used the local bus service (inexpensive, predictable, convenient, almost empty) and walked most of the time, where most people used cars, truck, atvs, and motorcycles. The only cyclists we saw were of the lycra-clad sporting type. The pedestrian realm ranged from non-existent up on Malmok where we were staying to downright hostile once you got a block off of the tourist strip in the resort areas. 4. Vacation notwithstanding, it’s good to be home. Posted on January 4, 2016 January 4, 2016 . by Patrick Johnstone. 7 Comments. This Post is actually an extended response to the comment by Ken, a Quayside resident and community builder, to my previous post about the Q2Q bridge. I thought his comments raised enough issues that I couldn’t do it justice just replying in a comment field! I will try to address your questions, but recognize that much of what you talk about occurred before my time on Council (so I was not involved in the discussions) and I respect that you have a much more intimate knowledge of the conversation on the Quayside over the last decade than I do. The project has indeed gone through various iterations in its history, and the initial plans ( here is a link to a report from the time) were to reach 22m of clearance to develop a fixed link that would get adequate clearance that we would not need Navigable Waters permission (read- not specifically need Marine Carriers permission) which required essentially the same height as the Queensborough Bridge. Conceptual drawings were developed based on the site conditions and some baseline engineering, and very preliminary cost estimates prepared. That concept was indeed reviewed by the Port (at that time, the Vancouver Fraser Port Authority) and note they even at the time preferred an upstream (east of the train bridge) location (see page 12 of that report I just linked to). Note also: that report suggests elevators at each end to improve accessibility. This is the concept that first went to public consultation, and concerns were heard about the need for long ramps that would have nonetheless been very steep, the overall height, the fate of the Submarine Park, etc. The only alternative to all of that height was a swing/bascule bridge. To explore this option, the City asked some engineers to sketch and (very preliminarily) price some alternative concepts, including a bascule and a sidewalk attached to the rail bridge. The City again took these preliminary concepts to public consultation, and the bascule design clearly came up as the preferred approach, even recognizing it was potentially more expensive. Now that a preferred concept was (hopefully) found, and the Q2Q crossing once again received endorsement from the new Council, it was time to actually pay a little more money to engineers to further develop the preferred concept to a level of detail that would allow screening for Port review. Not enough development for a full review, mind you (that will likely take several hundred thousand more dollars in engineering and environmental consultant fees and will no doubt also result in adjustments of the concept), but enough that it is worth the Port’s time to look at our concept and provide a detailed regulatory screening and provide us a pathway to approval. That is pretty much where we are right now, and for the third time, this concept is coming to the public for review. The only thing I can guarantee you at this point is that if (and it is still an “if”, despite general Council and public support) this project is completed, it will not look exactly like the drawings you see on the page today. There is much engineering to do, environmental review to perform, and more public discussion to be had. Satisfying the Port’s environmental review will be months once we get to that point, and we can guarantee it will require some design adjustments. There are also other adjustments I think we need to see based on public feedback this time around. Although I have held my cards close to my chest because I don’t want to prejudice the public consultation, I will admit up front that there are two things in particular I cannot tolerate in the plans as presented at the open house: the 8% ramps simply do not meet modern standards of accessibility; and the closing of the bridge at night is not an acceptable way to treat a piece of public active transportation infrastructure. I’m prepared to accept that we cannot have the Copenhagen-style transportation amenity I would prefer, but I am still hopeful we can find a compromise that provides an accessible, reliable, and attractive transportation connection. We are not there yet. (And please remember, I am only one member of a Council of seven, and I cannot speak for them). To answer what seems to be your main concern, I don’t know when the Marine Carriers were first consulted on this project, but the Port (who provides the Marine Carriers their authority) were clearly involved from day 1. They preferred an upstream location (now prefer a downstream one) and created the 22m by 100m “window” that led to the original 22m-high bridge concept, and have now led to evaluation of several swing/bascule concepts. Clearly, the City and our engineers have been searching for a creative solution to make what the politicians and public want mesh with the rather strict requirements of those who regulate the river and transportation. But serving those two/three masters is why the City is taking this iterative, slow approach, and why “plans that keep changing” are a sign of progress, not failure. One thing to think about is that every step of this process costs more than the previous step, and moving backwards costs most of all. As engineering analysis and design gets more detailed, it gets more expensive, so we don’t want to do the detailed work twice. We could have asked for a ready-to-build concept a decade ago, and done enough detailed design that we just needed to pull the trigger and we could have it built within a year, and then taken it to public consultation. But if things are found that don’t work (i.e. the initial 22m height), we have spent a lot on a concept we now need to spend more on to change. Instead, we do feasibility studies, take it to stakeholders, the public, the regulators, and are given feedback. We then develop the concept to get more engineering done, and again have a look at the result and either move forward or change track depending on feedback. This is a responsible way to plan, design, and pay for a public amenity. It is an iterative process, because as a government, we need to do our best to meet the needs of residents, of taxpayers who are footing the bill, of the regulations at 4 levels of government that have a thousand ways to limit our excesses, and of people who may be impacted by every decision we make. If a government claims to do three years of stakeholder and public engagement, detailed engineering analysis and business case development, then turn around and deliver to you the exact same proposal they managed to render in a 3D model three years ago when the analysis started, then you know their consultation was bunk. And I guarantee you, for every person who complains “this project has changed since the public consultation”, there are two who will say “public consultation never changes anything, they are going to ram their idea through regardless of what we say”. Actually, the same person will often say both, completely unaware of the irony. And that is why I appreciate your honest comments Ken, it sounds to me like you are trying to understand, not just complaining. So please provide your comments to the Engineering department and to Mayor and Council, and you will be heard! Posted on January 2, 2016 January 4, 2016 . by Patrick Johnstone. 4 Comments. 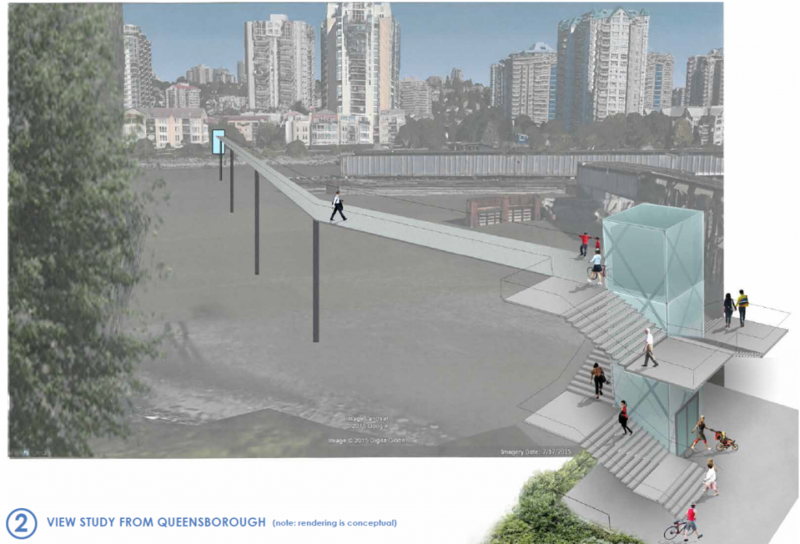 The Q2Q bridge is an important project for New Westminster, and one I support. It is, however, a project with major challenges, and I am glad we are at a stage where the next phase of public consultation is taking place, so we can talk about some of those challenges, and what they mean to the City. First off, I need to put my comments on the Q2Q into context, in relation to my position on Council. The Q2Q concept was developed long before I was elected, even before I started to rabble-rouse in the community on transportation topics. However, I have expressed strong support for the project for years, even piping up to challenge some of the past opponents of the concept. I have always believed, and continue to believe, that the Queensborough community needs to have a reliable, safe, and accessible connection to the “mainland” of New Westminster, and that connecting the beautiful waterfront greenways of Queensborough to the Quayside boardwalk will have huge benefits for both communities. When the topic came up during the election, I was quick to say I supported the project and wanted to see it built as soon as possible. Now that I am on Council, and am (in part) responsible for getting this project done, the brutal reality of the project has set in. The bridge some of us may dream of may not be possible in this location, and the development of palatable compromises is daunting and frustrating at times. It is becoming a lesson for me about the reality of planning for community infrastructure when a local government’s power is so limited. The bridge would be approximately the elevation of the boardwalks on either side, fully accessible, would be at least 3m wide, and would have an interesting design aesthetic that creates some regional buzz when it is built. As marine traffic would need to cross, it would have an innovative swing style that was integrated in to the design, and was an eye-catcher such that the 5-minute wait for the boat to cross was not something that irritated you, but intrigued you. It would even have areas over the water where you could sit, have a picnic, drop a fish line in the water, or take photos of crossing trains, passing boats, or overhead eagles. It would also represent an easy connection for people commuting by bikes, people out for a stroll, people pushing kids in a stroller – a seamless connection across the river. But that ain’t going to happen, because the City doesn’t own the river. Although the North Arm of the Fraser at that location is a significant industrial transportation corridor regulated by the Navigation Protection Act and Port Metro Vancouver. I cannot emphasize enough that the people who make a living moving things up and down the river would much prefer no bridge there at all, and due to the nature of the regulations, the people working the river get the say about what goes in, on, or over the river. If they don’t agree, nothing gets built. The “they” in the case of the North Arm of the Fraser River are the Council of Marine Carriers. They use the North Arm of the Fraser to move barges, boats, booms, and all sorts of floating things. There are no alternate routes, and their business relies on it, so they are pretty motivated to keep the North Arm accessible. If you haven’t noticed, the train bridge connecting the Quayside to Queensborough is open most of the time to marine transport, and only swings closed when a train needs to cross the river. This would not be a great situation for the Q2Q bridge if we want it to be a reliable transportation connection that pedestrians and cyclists can rely upon. We need a bridge where the default position is closed (to boats), that only swings open when the boats go by, with a cycle quick enough that it won’t cause major inconvenience for either user group. For the bridge to operate like this, the Marine Carriers have determined a clearance of 14.5m over the water is required. This would permit enough boats to pass under without opening the bridge that a default-closed position is acceptable to the folks who work on the river. This 14.5m makes for a pretty challenging crossing for cyclists or pedestrians with mobility problems. Hence, we can’t have the bridge we want. The question then becomes – how do we get people up to 14.5m? 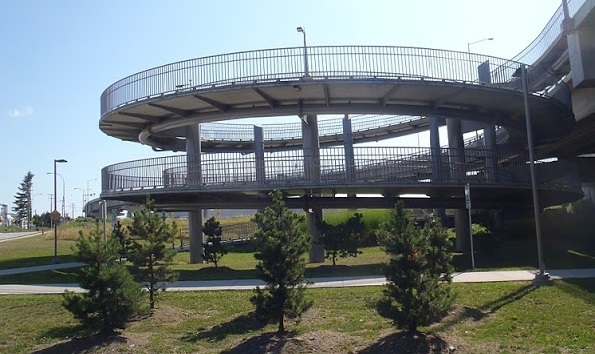 A ramp that meets typical mobility-access standards (i.e. no more than 5% grade – and yes, I am aware and frightened that 8% grades are shown on the rendering) would need to be about 250m long, even longer if we add standard landings at set distances. This would be expensive, and create a long visual intrusion for the Quayside residents next to the bridge. Stairs wrapped around an elevator column would have a much smaller visual impact, and if we can avoid the design mistake that led to a completely unacceptable delay on the Pier Park elevator (yes, we can), the size and scale of that structure is a good estimate of what the bridge landings would look like. …and I have my doubts whether Port Metro Vancouver would allow us to build such a structure over top of the water. It has already been suggested that the structure as proposed would require the highest level of environmental review (“Type D”) which makes it sound like a pedestrian and cyclist bridge will somehow have a bigger environmental risk than a coal terminal or LNG export facility. You may also have noticed the plans for the bridge shifted from being slightly upstream of the train bridge to slightly below. The upstream side as a little better for the City, as both landings work better, but the downstream was deemed safer for boat traffic. Unfortunately, this means the landing on the Queensborough side is going to be much more complicated (read: expensive) to build. Alas, we are stuck with what we have. I can complain about an industry group having more power than an elected local government about how our river is used, but as we learned in the Fraser Surrey Docks coal terminal discussions, the Port does not answer to local governments, but to their own mandate, and Sunny Ways are not likely to shift their business model any time soon. 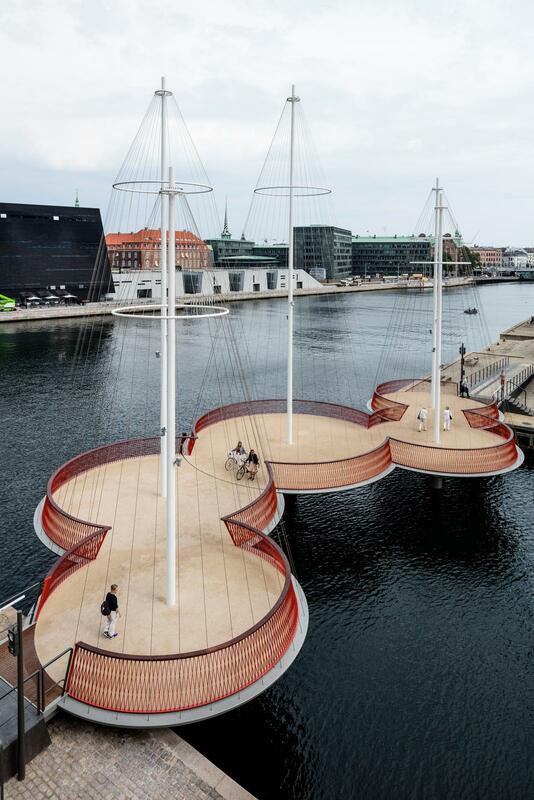 So we will do what we can to build the most accessible, most convenient, and most user friendly bridge within the constraints given us, even if it isn’t as elegant as one we might see in a place like Copenhagen.